Ikhtiyār al-Dīn Muḥammad Bakhtiyār Khaljī also known as Malik Ghazi Ikhtiyar 'l-Din Muhammad Bakhtiyar Khalji or Muhammad Bakhtiyar Khalji or simply Bakhtiyar Khalji (Bengali: ইখতিয়ার উদ্দিন মুহম্মদ বখতিয়ার খলজী, Persian: اختيار الدين محمد بن بختيار الخلجي), a military general of Qutb al-Din Aibak, was the first Muslim who conquered Bengal. His invasions have severely damaged the Buddhist establishments at Nalanda, Odantapuri, and Vikramashila. His conquest of Bengal ushered an era, lasting over five centuries, during which most of Bengal was dominated by rulers professing the Islamic faith. Bakhtiyar Khalji, a member of the Khalaj tribe, a Turkic tribe long settled in what is now southern Afghanistan, was head of the military force that conquered parts of eastern India at the end of the 12th century and at the beginning of the 13th century. Khalji came from the town of Garmsir in present-day southern Afghanistan. Tradition has it that Khalji's conquest of Bengal at the head of 18 horsemen was foretold. He was of common birth, had long arms extending below his knees, a short physical stature, and an unfavorable countenance. He was first appointed as the Dewan-i-Ard at Ghor. Then he approached India in about the year 1193 and tried to enter in the army of Qutb-al-Din, but was refused rank. Then he went further eastward and took a job under Maklik Hizbar al-Din, then in command of a platoon at Badayun in northern India. After a short period he went to Oudh where Malik Husam al-Din, recognised him for his worth. Husam gave him a landed estate in the south-eastern corner of modern Mirzapur district. Khalji soon established himself there and carried out successful raids into weakly-defended regions to the east. The image, in the chapter on India in Hutchison's Story of the Nations edited by James Meston, depicts the Bakhtiyar Khalji's massacre of Buddhist monks in Bihar, India. Khaliji destroyed the Nalanda and Vikramshila universities during his raids across North Indian plains, massacring many Buddhist and Brahmin scholars. Khalji's career took a new turn when he subjugated Bihar in 1200. This effort earned him political clout in the court at Delhi. In the same year he took his forces into Bengal. As he came upon the city of Nabadwip, it is said that he advanced so rapidly that only 18 horsemen from his army could keep up. He conquered Nabadwip from the old emperor Lakshmana Sena in 1203. Subsequently, Khalji went on to capture the capital and the principal city, Gaur, and intruded into much of Bengal. Bakhtiyar Khalji's invasions are believed to have severely damaged the Buddhist establishments at Nalanda, Odantapuri, and Vikramashila. Minhaj-i-Siraj's Tabaqat-i Nasiri suggests that Bakhtiyar Khalji destroyed a Buddhist monastery which the author equates in his description with a city he calls "Bihar", from what the soldiers learn is called a vihara. According to American scholar Hartmut Scharfe, the Tibetan sources suggest that this monastery was the one at Vikramashila; historian André Wink believes that this monastery must have been Odantapuri. According to the early 17th century Buddhist scholar Taranatha, the invaders massacred many monks at Odantapuri, and destroyed Vikramashila. The Tibetan pilgrim Dharmasvamin, who visited the region in the 13th century, states that Vikramashila had been completely razed to the ground by the Turushka (Turkic) invaders, and Nalanda was the residence of a Turushka military commander. Around 80 small viharas remained at Nalanda, but most of them had been damaged by the Turushkas, and had been abandoned: only two were in "serviceable condition". Ikhtiyar al-Dīn Muḥammad Khalji left the town of Devkot in 1206 to attack Tibet, leaving Ali Mardan Khalji in Ghoraghat Upazila to watch the eastern frontier from his headquarters at Barisal. Khalji forces suffered a disastrous defeat in the hands of Assamese King Prithu in Assam during Tibetan expedition. The entire army of Bakhtiyar Khalji was defeated by Tibetan forces, which forced him to retreat. His forces were then destroyed by King Vishwasundar Dev alias King Prithu Dev the descendant of King Vaidya Dev. Khalji then returned to Devkot with about one hundred surviving soldiers. Upon Ikhtiyar Khalji's return while he was lying ill at Devkot, he was assassinated by Ali Mardan. Loyal troops under Muhammad Shiran Khalji avenged Ikhtiyar's death, imprisoning Ali Mardan. Ghiyas-ud-din Iwaz Khalji became the successor. Ali Mardan escaped and was made Governor of Bengal by Qutb-ud-din Aibak, but was killed in 1212. Ghiyas-ud-din again assumed power and proclaimed his independence. Al Mahmud, a leading Bangladeshi poet, composed a book of poetry titled Bakhtiyarer Ghora (Horses of Bakhtiyar) in the early 1990s. He depicted Khalji as the praiseworthy hero of Muslim conquest of Bengal. During Bakhtiyar Khalji's reign, Islam gained a large number of converts in India. Muhammad Bakhtiyar Khalji had the Khutbah read and coins struck in his own name. Mosques, madrasas, and khanqahs arose in the new abode of Islam through Bakhtiyar's patronage, and his example was imitated by his Amirs. Buddhist sources hold him responsible for the destruction of Nalanda. ^ "Ikhtiyār al-Dīn Muḥammad Bakhtiyār Khaljī | Muslim general". Encyclopedia Britannica. Retrieved 9 September 2018. ^ Majumdar, Dr. R.C., History of Mediaeval Bengal, First published 1973, Reprint 2006,Tulshi Prakashani, Kolkata, ISBN 81-89118-06-4. ^ a b c d Hartmut Scharfe (2002). Handbook of Oriental Studies. BRILL. p. 150. ISBN 90-04-12556-6. 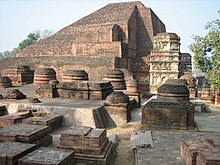 Nalanda, together with the colleges at Vikramasila and Odantapuri, suffered gravely during the conquest of Bihar by the Muslim general Muhammad Bhakhtiyar Khalji between A.D. 1197 and 1206, and many monks were killed or forced to flee. ^ Eaton, Richard Maxwell (1 January 1996). "The Rise of Islam and the Bengal Frontier, 1204-1760". University of California Press – via Google Books. ^ the Khiljī tribe had long been settled in what is now Afghanistan ... Khalji Dynasty. Encyclopædia Britannica. 2010. Encyclopædia Britannica Online. 23 August 2010. ^ Sarkar, Jadunath, ed. (1973) [First published 1948]. The History of Bengal. Volume II: Muslim Period, 1200-1757. Patna: Academica Asiatica. pp. 3, 8. OCLC 924890. ^ Sarkar, Jadunath, ed. (1973) [First published 1948]. The History of Bengal. Volume II: Muslim Period, 1200-1757. Patna: Academica Asiatica. pp. 2–3. OCLC 924890. granting him in jagir two parganas in the south-eastern corner of the modern Mirzāpur district ... having supplanted the petty Gahadvār chiefs of this tract, he began ravaging the open country to the east ... he confined himself to scouring the open country undefended by the field army of any organised State. ^ Sarkar, Jadunath, ed. (1973) [First published 1948]. The History of Bengal. Volume II: Muslim Period, 1200-1757. Patna: Academica Asiatica. p. 3. OCLC 924890. Bakhtyār led his army a second time in the direction of Bihar in the year following the sack of the fortified monastery of that name. This year, i.e. 1200 A.D., he was busy consolidating his hold over that province. ^ Sarkar, Jadunath, ed. (1973) [First published 1948]. The History of Bengal. Volume II: Muslim Period, 1200-1757. Patna: Academica Asiatica. p. 8. OCLC 924890. Bakhtyār fairly completed his conquest of the Varendra tract with the ... city of Gaur before the year 599 A.H.
^ Sen, Amulyachandra (1954). Rajagriha and Nalanda. Institute of Indology, volume 4. Calcutta: Calcutta Institute of Indology, Indian Publicity Society. p. 52. OCLC 28533779. ^ a b c d André Wink (2002). Al-Hind: The Slave Kings and the Islamic conquest, 11th-13th centuries. BRILL. pp. 146–148. ISBN 0-391-04174-6. ^ Nitish K. Sengupta (1 January 2011). Land of Two Rivers: A History of Bengal from the Mahabharata to Mujib. Penguin Books India. pp. 63–64. ISBN 978-0-14-341678-4. ^ William John Gill; Henry Yule (9 September 2010). The River of Golden Sand: The Narrative of a Journey Through China and Eastern Tibet to Burmah. Cambridge University Press. p. 43. ISBN 978-1-108-01953-8. ^ Chandra, Satish (2004). Medieval India: From Sultanat to the Mughals-Delhi Sultanat (1206–1526) – Part One. Har-Anand Publications. pp. 41–43. ISBN 9788124110645. ^ "Al Mahmud". Truly Bangladesh. Retrieved 22 January 2014. ^ Arnold, Sir Thomas Walker (1896). The Preaching of Islam: A History of the Propagation of the Muslim Faith. pp. 227–228. ^ Ichimura, Shōhei (2001). Buddhist Critical Spirituality: Prajñā and Śūnyatā. Motilal Banarsidass. p. http:65 (note 87). ISBN 978-81-208-1798-2. ^ Sen, Gertrude Emerson (1964). The Story of Early Indian Civilization. Orient Longmans. OCLC 610346317. History of the Muslims of Bengal – Volume 1A: Muslim Rule in Bengal (600-170/1203-1757), by Muhammad Mohar Ali, Imam Muhammad ibn Saud Islamic University, Department of Culture and Publications. Ahmed, ABM Shamsuddin (2012). "Bakhtiyar Khalji". In Islam, Sirajul; Jamal, Ahmed A. (eds.). Banglapedia: National Encyclopedia of Bangladesh (Second ed.). Asiatic Society of Bangladesh. Chowdhury, AM (2012). "Sena Dynasty". In Islam, Sirajul; Jamal, Ahmed A. (eds.). Banglapedia: National Encyclopedia of Bangladesh (Second ed.). Asiatic Society of Bangladesh. This page was last edited on 25 April 2019, at 13:45 (UTC).